What You Need to Know About Blood Tests & DUIs in New Hampshire? Police in New Hampshire have three different ways of detecting people who are driving while intoxicated (DWI): There are breath tests, urine tests, and blood tests. Each of these tests aims to determine your blood alcohol content (BAC), which -- in theory at least -- puts a number on how inebriated you are. However, some of these tests are more reliable than others. The reliable tests, unfortunately, are also the most invasive and the most difficult to perform outside of a controlled medical setting or on the road during a traffic stop. This conundrum makes enforcing New Hampshire’s DWI laws complicated. Out of all of the kinds of BAC tests, blood tests are the most accurate, but also the most invasive. When you take a sip of an alcoholic drink, the liquid loiters in your mouth until it is swallowed, at which point it goes down your throat, into your stomach and, from there, into your intestines. Throughout its travels, though, the alcohol in the liquid seeps through the inner linings of your organs. Once outside of your stomach and intestines, the alcohol enters the bloodstream where it gets carried through your veins and arteries to the rest of your body. In this way, the alcohol you drink makes its way to your brain, where it impacts your ability to function. In theory, the concentration of alcohol in your blood is directly proportional to how inebriated you are. However, in reality, it is far less precise: some people function far better at the legal limit of 0.08% BAC than others do. Testing your blood to determine your BAC is the most reliable way for police to get an accurate reading. The other types of tests—which collect your breath or your urine—only determine the amount of alcohol in your blood indirectly. Because those types of tests only indirectly determine your BAC, there are a whole host of environmental factors that can influence the reading and skew the result. Blood tests, on the other hand, take a sample of blood from your veins and test that sample for alcohol, drastically reducing the chances of an exterior factor impacting the results. However, the very strength of a blood test also creates their biggest weakness for law enforcement: by taking a sample straight from one of your veins, police are conducting one of the most invasive searches possible. Additionally, the potential medical problems typically associated with drawing blood make it nearly impossible to do outside of a controlled medical facility, let alone on the road during a traffic stop. These complications raise serious issues for police who want to gather evidence that you are driving under the influence. Without the ability to do a blood draw during the traffic stop, police are often forced to take a breath test instead, only resorting to a blood draw if the results of the breath test are over the legal limit and they can bring a suspect to the police station or to a hospital. In cases involving a serious car accident that puts a DWI suspect in the hospital, police often try performing a blood test there. Because blood tests are so intrusive, the law requires that police take extra precautions before taking a blood sample. The Supreme Court has gone so far as to say that while police can put criminal sanctions on drivers who refuse to take a breath test without a search warrant, police cannot do the same for blood tests. The amount of information that a blood test gives to the government, together with the invasiveness and discomfort of a blood draw, may requires police to produce a search warrant before they can criminalize a refusal. However, this does not mean that police need to have a search warrant before performing a blood test for BAC. Many charges for DWI in New Hampshire rely mainly, or even solely, on the evidence produced by a blood test. Therefore, defending against that evidence can mean the difference between a conviction and an acquittal. DWI-defense attorneys have several tools up their sleeves to minimize the damage from that evidence, throw doubts as to its reliability, or even keep that evidence from ever making it into the courtroom. 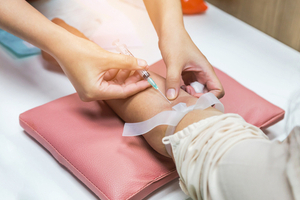 Blood tests, though they are more reliable than breath or urine tests because they directly sample your blood, are still not perfectly accurate. Mistakes can be made during the blood draw process or during the lab work that determines the alcohol content in the sample. These can taint the results and prevent a jury from finding, beyond a reasonable doubt, that you were under the influence. Even if they are correctly done, the impact of a blood test that comes in only just above the legal limit to drive can be minimized by an effective DWI-defense attorney. Finally, many searches, including blood tests for DWI, are done in ways that infringe on your civil rights. When they do, the evidence that is found can be excluded from your trial, effectively scuttling the prosecutor’s case against you. For example, if the traffic stop that led to your arrest and subsequent blood test was done arbitrarily or for no reason, an effective DWI-defense attorney can challenge the admissibility of the blood test. New Hampshire DWI-Defense Attorneys at Tenn And Tenn, P.A. The DWI-defense attorneys at Tenn And Tenn, P.A. fight for your rights if you have been arrested and charged with drunk driving. Contact us online or call our Manchester, NH law office at (888) 511-1010 for the legal help you need to beat these accusations.